The district has packed as many as 49 students in a single classroom, but it only receives full state funding for the first 33 students. 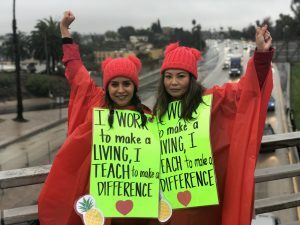 Thousands of Los Angeles, Calif., teachers and other school workers strike and march in a steady rain on Jan. 14, 2019. These teachers are from the Sunset Gauntlet school district. Photo: UTLA. Last November, General Motors (GM) announced the closing of five North American plants, including the 23.5 miles of conveyor dedicated to the Chevy Cruze in Lordstown, Ohio. In nearby Youngstown in July 2017, Donald Trump had told supporters at a rally not to sell their homes in the downward spiral housing market. “We’re going to fill those factories back up!” he exclaimed. Now, about 14,000 auto jobs will disappear. Part of the reason these particular plants stayed open was to raise the average fuel economy of GM’s fleet so that the company would meet Corporate Average Fuel Economy (CAFE) emissions standards. In 2007, President George W. Bush signed the Energy Independence and Security Act, setting a goal for the national fuel economy standard of 35 miles per gallon (mpg) by 2020. In 2012, the EPA under Obama set an administrative goal of 54.5 mpg by 2025. It is this rule that Trump retracted last August, reducing the 2025 goal to about 37 mpg. Furthermore, his appointee to lead the National Highway Traffic Safety Administration, Heidi King, refused to make inflation-tagged increases to noncompliance penalties, in violation of federal law, until she was finally forced to do so by an injunction granted last June. GM is expected to move its production lines for smaller vehicles like the Cruze to plants in Thailand and Mexico. Meanwhile the company will leave in place more profitable plants, running 24 hours a days and seven days a week, which produce the gas-guzzling SUVs and trucks that are in demand since gas prices have fallen. U.S. CO2 emissions, a driver of global warming, were going down. They are again on the rise, exacerbating an already alarming prognosis for the environment. Neither the plight of workers nor the impending climate catastrophe determine corporate decisions made under the rules of capitalism. It does not matter if an individual capitalist is greedy or not; if surplus value—the amount of value created by a worker but not paid out in compensation—is not extracted vigorously enough, another capitalist enterprise will do it. GM cannot help but shift production to the gas-guzzler models after the disappearance of external conditions that were disincentivizing such a move industry-wide. This is why the auto industry opposed Trump’s rollback of CAFE as excessive. It was pushed through by the oil industry over auto’s objections. Missing from media coverage of the GM closures was the context of labor struggle in the 1960s and 1970s that led Big Auto to locate new factories literally in the farm fields. Lordstown was and still is more than 95% white. Its factory was built in a time when Black workers were predominant in leading strikes for better wages and treatment. Nearly every time they struck, they had to circumvent the mostly white union leadership in the United Auto Workers (UAW), who would systematically block the demands of Black workers doing the toughest jobs. For example, in May 1968, Black workers, who were about 60% of the workforce at Dodge Main, organized with Polish women workers to strike against Chrysler’s speed-up—from 49 cars per hour to 68—with no commensurate raise in pay. Their walkout was 4,000 strong, and since Black workers mostly filled less-desired assembly line jobs, their absence brought production to a halt. Indignant Heart: A Black Workers’ Journal by Charles Denby. To order, click here. If GM managers thought they could avoid militant workers by relocating themselves amidst a seemingly more compliant workforce in the rural Midwest, they were at least partially wrong. By 1975, the Lordstown plant’s heavily robotic Vega assembly line was the fastest in the world. This was the crux: the frenetic pace of the work and aggressive depersonalization of robotic automation soon compelled 7,800 white workers first to sabotage the production line and eventually to strike for 21 days in 1972, to be followed by many more “human dignity” strikes throughout the early 1970s. GM now plans to move most of the Lordstown production line to countries where they can pay workers less and keep more of the value they produce. Furthermore, the threat of moving abroad gives GM a weapon against work stoppages. There is dire need for building international solidarity with Mexican manufacturing workers and, for that matter, with Chinese manufacturing workers, who went on strike more than 1,700 times in 12 months against the wishes of China’s state-run unions. That “disloyalty” is also evident in GM’s heavy investment in automation. Karl Marx theorized in Capital that only the human labor power “crystallized” in a given commodity determines that commodity’s value. The workers who run the machine, the robotic arm, the self-driving truck, continue to sell their labor power for less than the value of what they produced. Automation reduces the labor time that is socially necessary to produce a commodity, thereby reducing the commodity’s value. Companies like GM are then left with fewer workers to extract surplus labor from, but they keep trying to extract more and more value from each of them through increased production per worker per day. This trend drags down the rate of profit, leading to collapse in productive investment and business failures. All attempts to make workers work harder, faster and longer for less and less pay—or to cut costs by throwing workers onto the street—become amplified once the overall rate of capital accumulation collapses on a global scale, as in 1929 or 2008. No amount of skewing even more wealth to the capitalist can negate the fact that capital is driven to eliminate living labor from the process. GM’s closures come after a $49.5 billion bailout by the Obama administration when GM faced bankruptcy after the 2008 economic collapse, and they come after Trump and Congress gave a collective $1.5 trillion tax cut to the corporate world. These taxpayer gifts were not primarily reinvested in capital expenditures to create promised new jobs; what did go into reinvestment often went toward automation that eliminated or will eliminate jobs. Fueled by the tax giveaway, stock buybacks to bolster stock prices exceeded $1 trillion in 2018. GM itself spent nearly $14 billion on stock buybacks. Whereas before 1998 nearly half of business investment went into industrial equipment and material expansion of facilities, that kind of investment now only accounts for 29%. 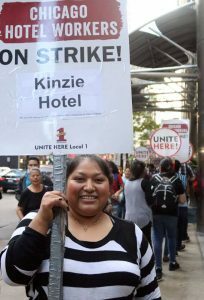 Striking Chicago hotel worker, September 2018. Photo: Unite Here. As storm clouds loom over the economy, workers in ever more precarious positions have a lot to lose. Even the investor class is nervous as Trump wages trade war and drags out a record government shutdown, heedless of the workers’ and contractors’ lives being ruined. He begins the second half of his term with no permanent chief of staff, attorney general, secretary of defense, interior secretary, EPA administrator, or ambassador to the UN. Internationally, the United Kingdom faces the prospect of a hard Brexit, Italy and Germany are on the brink of recession, and China’s growth has slowed painfully. The weakness led to the deepest stock market fall since the global financial crash in 2008. The interest rate on government bonds fell below the Fed’s prime borrower rate for the first time since 2006, indicating that these “safe” investments (U.S. bonds) are suddenly in high demand. Standard and Poor’s rated the global issuance of leveraged loans in 2017 at over $700 billion, which for the first time exceeded the pre-crash 2007 level. The 2018 total went down to just a hair below the 2007 level. Even if a U.S. recession is not immediately in the cards, Trump is working heedlessly to stack the deck. The government shutdown, which he said could last a whole year, has left 800,000 government workers without pay, even though half are still forced to work. An unknown number will be evicted, and many contractors are going unpaid the way contractors for the Trump Organization did. Food stamp money runs out in February, and the USDA program designed to compensate U.S. farmers for lost income resulting from the US-China trade tariffs is also on hold. Absent a diplomatic breakthrough, these tariffs are set to increase from 10% to 25% on March 2. U.S. manufacturers are in frantic competition with their own suppliers and customers to stick some other company with the tariff premium. As seen in previous economic downturns, they also pass the pinch down to low-wage workers, who cannot pass it any further. To accept “We’re capitalists, that’s just the way it is,” the immortal words of Speaker of the House Nancy Pelosi, would be to concede that workers must submit to the dictates of capital’s self-expansion at their expense, rather than taking control of their own activity. The capitalist perspective on reality has no concern for the conditions of life and labor of the ordinary worker, whether it is for the environmental impact on human beings and the earth itself, or for creating jobs with a living wage. Our times, as never before, demand addressing auto and other workers’ persistent concern: a work life fit for humans. This entry was posted in Articles and tagged Acero, American Federation of Teachers, automation, Black workers, Buddy Bell, capitalism, Charles Denby, Chicago teachers strike, Corporate Average Fuel Economy, Dodge Main, Dodge Revolutionary Union Movement, Donald Trump, DRUM, Energy Independence and Security Act, Falling Rate of Profit, food stamps, General Motors, global warming, Heidi King, hotel workers, Kaiser Permanente, Karl Marx, labor, labor power, laws of surplus value, Lordstown Ohio, Los Angeles, Los Angeles United School District, low-wage workers, Marriott, Marxist-Humanism, Nancy Pelosi, National Education Association, News & Letters, recession, socially necessary labor time, tax cuts, teachers, U.S. government shutdown, UAW, Unifor, United Auto Workers. Bookmark the permalink.